This post continues the series on Digital Games and Learning. 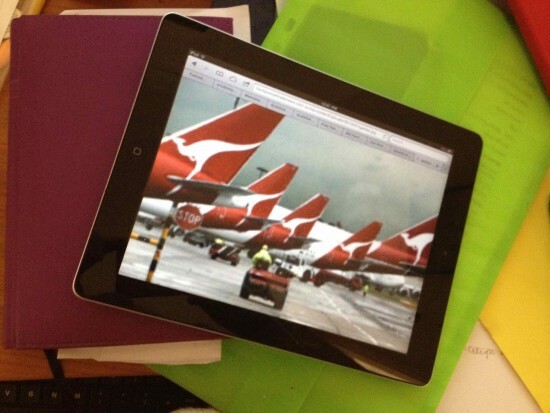 Rebecca Fraser, a Melbourne author, shares her perspective about ipads and learning, from watching her five year old’s learning at the airport. For the past year my husband and I have been debating whether to purchase an iPad for our son. We reasoned it would be an excellent source of entertainment and education, as well as exposing him to interactive technology which, let’s face it, is entrenched in our everyday lives for evermore. I’ve observed many other children my son’s age happily engaged with iPads. They seem an ideal way to keep a child occupied at times where patience needs to be exercised and noise levels kept to a minimum. You know, all the usual places where a parent normally comes unraveled by their son or daughter’s behavior: the doctor’s waiting room, an appointment with the bank, the dreaded Medicare queue and, more recently for me, the airport lounge. My son and I were travelling to Tasmania to visit my parents in Hobart for the weekend. We arrived at Melbourne’s Gate 27 in plenty of time for the flight and settled in for the long wait (well, an hour is long for a five year old), before boarding. Now, I know age may not seem like a massive variable, but for me it is. I was raised in a family where television was a luxury reserved for after five pm only. Heaven forbid it went on during daylight hours for that was deemed “a waste of a day”. Hey, it didn’t do me any harm, and I guess it left its mark on me, because I now feel that my son’s time could be better occupied by engaging in the world that is unfurling around him, rather than with a bunch of Angry Birds on a screen. With this principle in mind, bolstered by the natural curiosity of a five year old, our wait in the airport lounge turned into a most fulfilling time with my son. An airport is a wondrous place for little (and big) kids. It is full of unfamiliar machinery, equipment, people with cases, people with uniforms, people with stern faces, people with happy faces, people with cases, and binding it all together is an oxymoronic energy of romance and stress that is unique to busy airports. The pilot walked grandly through the terminal and across the tarmac to our waiting plane (most impressive for a 5 year old boy)! Outcome: What does a pilot do? How do you become a pilot? Who helps the pilot? A crew of flight attendants bustled past. Outcome: Who are they? What’s a flight attendant? (so much more than the insulting stereotype of ‘trolley dolly’)? From the window we watch the luggage being ferried out, aircraft maintenance inspections being carried out, refueling and restocking of consumables. Questions, questions and more questions. The inevitable: “How much longer before we go on the plane?” lead to a lesson on telling the time. Well, we covered the fundamentals of “when the big hand gets to ….” anyway. All in all, the hour passed in a manner that I hope my son found more enriching, enjoyable and educational as an hour spent gaming. Now, let me reiterate that I am not against iPads or gaming devices for children. Not at all, and the jury is still out on whether or not I will get one. I just wanted to share an alternate view from a parental perspective. Perhaps we shouldn’t be so quick to flick a switch in order to occupy our children, when there is a whole world of wonder going on around them. Excellent insights, Rebecca. Thank-you. Check out our previous posts in this series. Yesterday’s was Impressing the Principal, from knowledge learned through gaming. Tomorrow’s post looks at a great use of iPads for learning at the museum with ‘The Museum Game’. Rebecca Fraser is an author living in Melbourne, Australia. She has published a number of short stories and has a penchant for speculative fiction - particularly horror. Rebecca is currently doing a masters in creative writing.